The BLT is a much beloved, stand by sandwich and we’ve made sure to honor that, but also give it a quirky update fit for the modern millennial. Fresh slices of juicy ripe tomatoes, crisp pieces of lettuce, and perfectly cooked pieces of thick-cut bacon along with a creamy herbed mayo spread and some salt and pepper for seasoning. Such a simple sandwich filling, and yet exploding with vibrant flavors. It’s all sandwiched between two toasted waffles for that ideal crunch in every bite. I will never forget the moment I got the call. I was at our youngest sons’ 2 month check up appointment waiting for the doctor to come in the room and give him the once over. My phone rang. It was my mom. And I knew. I was supposed to head over to the rehab facility with Son # 4 after the appointment to get some good pictures of him and my grandmother. W’ed put it off in the prior week and a half she’d been in the hospital because she was too worried about the risk of his exposure to germs on her floor. The moment my Mom left her side (literally the only moment she’d been alone in her entire stay) she breathed her last. I know she was relieved to finally be reunited with the love of her life, my grandfather, but I couldn’t picture a single day of my life without her. It punched a hold in my heart almost as if I’d received the news that my own Mom was gone. Her hand helped guide me and shape the woman I am today just as much as my own mother did. There isn’t a day that goes by that I don’t talk to my kids about her, about the woman she was and the values she had. Grandma always gardened. I look back fondly on my younger years when her garden was HUGE and took up half of her backyard. I’d help her pick whatever was ripe, especially her favorite–rhubarb. She’d put it in pies, even ice cream. We’d sit in her living room with her in her favorite rocking chair and me at her feet, while her sassy little soap opera played in the background, and snap beans together for supper. The other thing her garden always had? Bright red, juicy tomatoes fresh off of the vine. If I had been forced to choose a single food to live on for the rest of my days it would have been her tomato sandwiches on toast. I bring all this up to help illustrate a point. Especially in the South, where tomatoes seem to grow like kudzoo vine, we grew up eating them for lunch, snack, and dinner and are even used to them being incorporated into breakfast and brunch. And aaaalllllll our childhood diets included a steady stream of these sandwiches, AND most of us probably have a favorite memory or two associated with them. Mine all center around my Grandma. My hope is that this fun and funky twist on the classic will be at the center or memories that my own boys fondly look back on one day down the road. 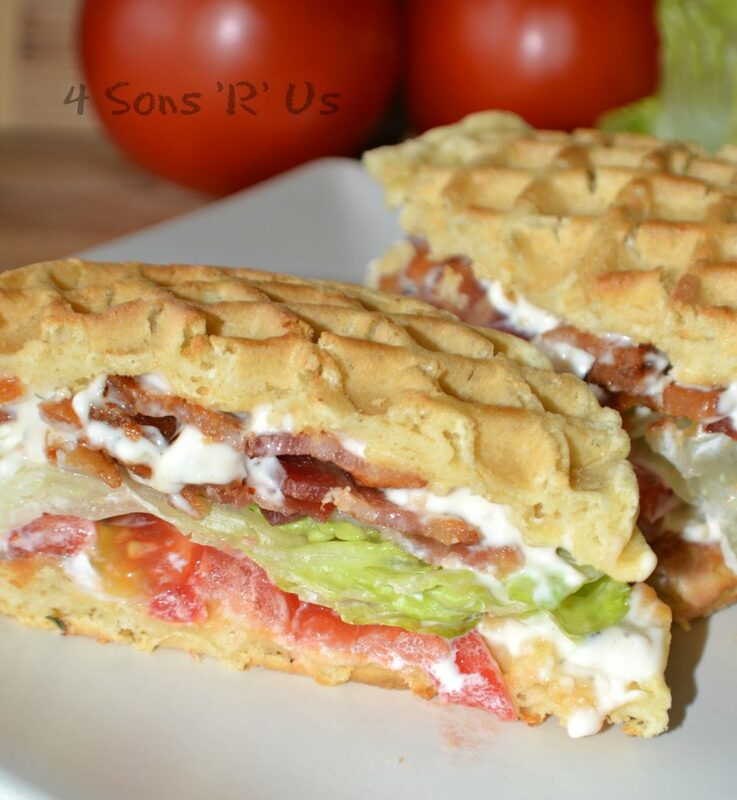 The classic BLT sandwich has been given a quirky twist by swapping toasted waffles for toast and a gourmet upgrade with a creamy, herbed mayonnaise spread. In a small bowl whisk together the mayo, garlic, basil, and dill until evenly combined. Cover the spread and refrigerate until ready to use it. Line a baking sheet with parchment paper and lay the strips of bacon out on it. Put the bacon in the cold oven, and then turn the oven on to 400 degrees and set the timer for 17 minutes. When timer goes off, remove cookie sheets from the oven and transfer the crisp, cooked bacon to a paper towel lined plate. Pat the bacon gently with the outer edges of the paper towel to remove any remaining grease. Double toast the frozen waffles. 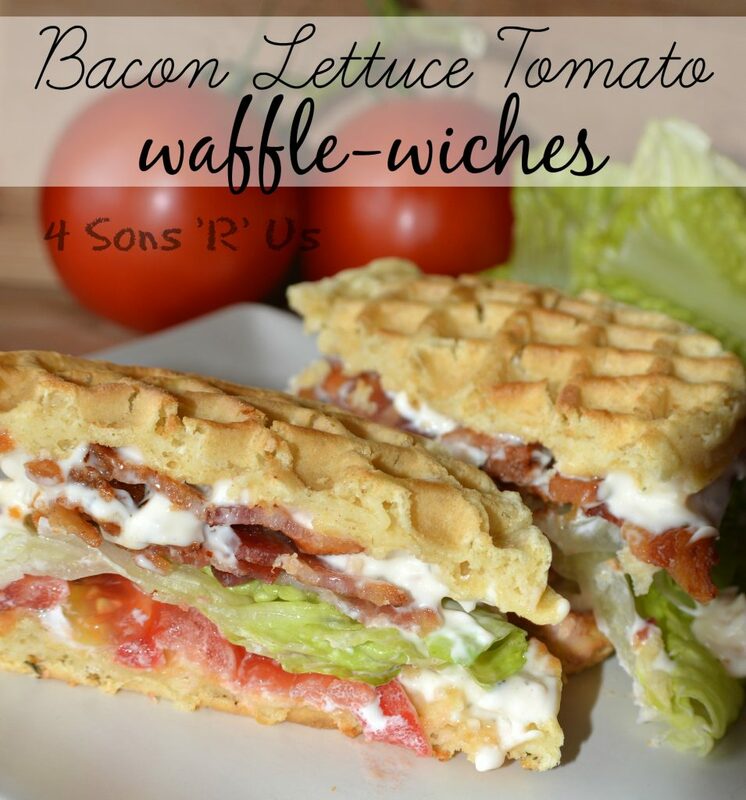 Assemble the blt's by spreading roughly 2 tablespoons of the seasoned mayo evenly out onto the inside of each waffle. Top with tomato slices, a couple lettuce leaves and two - three strips of bacon. Top with another prepared waffle. Serve immediately so the waffles stay crisp and don't get soggy. Homemade waffles can be substituted for store bought frozen ones. What’s your favorite tomato/blt-related memory? What a wonderful story and that sandwich looks Fricking amazing! Thanks for the story about your family. Great memories often surround foods we eat. Pinned and shared! Hey Meaghan! Thanks so much for such a great recipe! I’m excited to let you know that you will be featured on You Link It, We Make It tomorrow as my feature! Have a great day! Congrats on your feature Meaghan, I can’t wait to try this one! Kim said it was YUM! Looks so cool!